Cheaper Car Hire at Miami Airport. Compare SUV, Minivan & 7 seat MPV rental for Miami, Cruise Port & beaches. We have reduced car hire rates from the likes of:- Dollar, Budget, National, Sixt and Alamo. 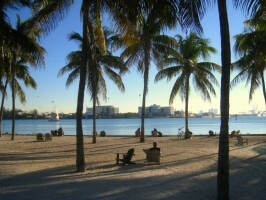 Vehicles can also be booked on Miami Beach (north and south) and at the Port of Miami. The port is located on Biscayne Bay. It is widely known as the Cruise Capital of The World. Extra Drivers, Fuel & Sat Nav - Depending on how long you want to rent for, then you will have the option of being able to pre-pay for these options. Altogether you have a choice of four rates. The main car rental companies have registration counters located inside the baggage reclaim area. Wide choice of car categories. All cars are now more fuel efficient and come with the latest in safety features including ABS, air-con, CD radio plus dual airbags. Alamo have two depots on the beach front, at Miami North Beach, and South Beach. Cars can be collected here and returned to the airport, without any extra charge. Budget and Dollar also have depots on the beach roads. Whenbooking your vehicle, you can then choose to either add up to 3 extra drivers, save on fuel and add Sat Nav to the pre-paid rental price. Save on driving costs when hiring in Miami. Cheaper sedans are available in Miami. Minivans to seat from 7 people. Book a convertible and cruise down to the Keys. Ideal for a large group of up to fifteen people. This is one of the busiest world airports with a through put in excess of 40 million passengers annually. One big terminal with 8 concourses (A to H). Concourse D is reserved for domestic flights. Contact details:- Telephone 305 876 7000. A tourist information desk is located on level 2 Concourse E, the helpful staff will assist with any travel related issues. The airport hotel is also located on concourse E please book in advance as always busy. Snack bars located throughout the airport are open 24 with a wide range of cafes, restaurants and bars. A wide range of duty free shops with designer label selling clothing. The airport of Miami is also known locally as the Wilcox Field. This airport is the main airport that serves Florida, along with the Orlando Airport. The airport is well connected with easy access to the major highways, ideal for a fly and and drive adventure. More choice also for Florida.